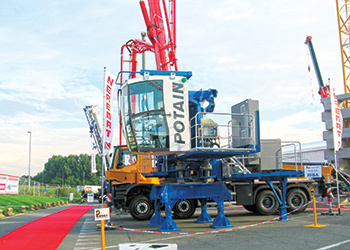 A Potain crane on display at Matexpo. Manitowoc showcased a selection of cranes, including the new Potain MDT CCS City tower crane, at an international exhibition last month, marking the debut of the unit at a trade fair. 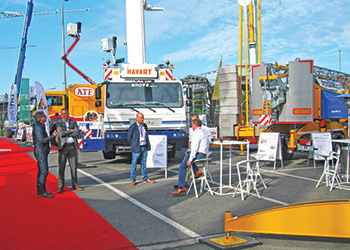 Units from the Grove and Potain brands were exhibited at Matexpo 2015, a trade show for building machines which was held at Kortrijk Xpo in Belgium from September 2 to 6, providing Manitowoc with an opportunity to promote its new five-axle Grove platform and the Potain MDT CCS City tower crane range. The MDT CCS City range, which received a great deal of interest from the show’s visitors, features Manitowoc’s latest Crane Control System (CCS) and between 55 to 65 m jibs, with hoisting capacities from six to 10 tonnes. The user-friendly CCS helps to get more work done faster, with great precision, while achieving the highest level of comfort, ergonomic control and lifting capacity, says a spokesman for Manitowoc. The showcase at Matexpo 2015 was staged in coordination with long-standing local dealers Belgium Lifting and Equipment (BLE) and Neremat. Also promoted at the show were Manitowoc’s latest in the Grove five-axle range – the recently launched 250-tonne capacity GMK5250L and the brand-new GMK5180-1 and GMK5200-1 all-terrain cranes. Models from the Grove brand. Together with the GMK5250L, the new Grove five-axle cranes are claimed to be the first in the industry to offer VIAB turbo retarder clutch, which eliminates both fluid overheating and clutch burning, while enabling wear-free starting and braking. It also contributes to fuel savings. And in common with new Grove launches, the GMK5180-1 and GMK5200-1 are powered by a single engine – a Tier IV Final/Euromot 4 Mercedes-Benz OM471LA, a six-cylinder diesel engine with a 390 kW (520 hp) rating and a maximum torque of 2,460 Nm. The standardised CCS features in the cab and is a user-friendly interface that Manitowoc is introducing on all new all-terrain crane models, as well as crawler, rough-terrain, truck and tower cranes. The CCS components and operating software have been specifically designed, developed and tested by Manitowoc engineering and innovation teams worldwide to ensure the highest reliability standards, the spokesman points out. The cab also features a new ergonomic jog dial and new joysticks. Founded in 1902, Manitowoc is a multi-industry, capital goods manufacturer with 92 manufacturing, distribution, and service facilities in 25 countries. The company is globally renowned as a premier innovator and provider of crawler, tower, and mobile cranes for the heavy construction industry.